Paul Kruger as a stage hero and film star. The representation of the Boer War and the rise of nationalism in the Netherlands between 1899 and 1902. The dramatization of current events on stage and in film began to attract a large audience at the end of the nineteenth century. The Second Boer War (1899-1902) in South Africa between the Boer republics and Great Britain provided rich material for four plays, which were staged in popular theatres in a short space of time. Prior to that three theatre companies had hit the stage with sensational melodramas about the Dreyfus affair. The interest in visualization and dramatization of the news in theatre and film peaked around 1900. The rise of ‘newspaper dramatics’ coincided with a rare but fierce outburst of nationalism in the Netherlands. Film and theatre benefitted from the widespread enthusiasm for the nation and served as a catalyst to these passions at the same time. This study argues that the intensity, dissemination and duration of the nationalistic euphoria were fuelled to a large extent by the ascent of sensational spectacles, which unlike the press could generate strong emotions in halls packed with spectators. Because of these and other changes in the media landscape, the national consciousness could grow wings by the end of the century. 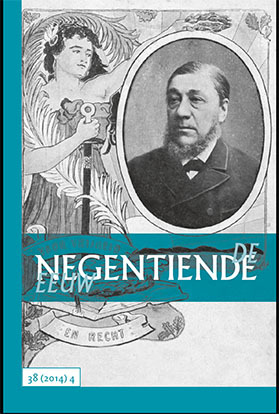 Drawing upon little known publications of the playwright Herman Heijer mans and other sources, the article maintains that the Boer leader and president of the Transvaal Republic, Paul Kruger, owed his rise to popularity and stardom in the Netherlands as much to popular theatre and film as to the printing press. The fame of ‘The Rhine’. Celebrity culture around Elias Annes Borger. No destiny has provoked so much compassion in the nineteenth century as that of the Frisian scholar and poet Elias Annes Borger (1784-1820). Although nowadays hardly anybody has heard of him, in the nineteenth century he was a well-known poet, though he only published a few poems for special occasions. Particularly famous at the time was the ‘The Rhine, in the spring of the year 1820’, which he wrote after the death of his second wife. Throughout the nineteenth century the poem became a cultural reference point in the Netherlands. Mainly because of this literary work, Borger posthumously received the position of a literary celebrity. This article analyses why the poem remained popular for such a long period of time. Furthermore, it explores the mythologization and ‘fan culture’ around Borger himself. The case of Borger is exemplary of the literary celebrity cult around a poet in the nineteenth century. State Martyrs. Batavian Stoicism and the Political Imprisonment in Huis ten Bosch in 1798. After they had fallen victim to a coup d’état in January 1798, 22 former Members of Dutch Parliament were imprisoned in the ‘Batavian Bastille’ near The Hague. Alba Amicorum (friendship books) circulated amongst the prisoners in order to keep morality high. In this article, I give a detailed analysis of the inscriptions in these Alba, as a means to shed new light on the Dutch reception of Stoic philosophy at the turn of the nineteenth century. More specifically, the focus is on the Stoic theory of emotional restraint, which not only shapes our present-day understanding of Stoicism, but has also functioned as a model of conduct for the moderate revolutionaries of the Batavian Republic.